Jesus is saying, that without the indwelling of the Holy Spirit in a person’s life, there is no way for them to know God or to see things from a spiritual heavenly view. Unbelievers are blind to the things pertaining to God and His kingdom, they cannot see beyond the human realm which the Bible calls the flesh. They go by their instincts, feelings and emotion that are purely from a human level and not a divine level. Most people live by what they can see touch or smell and they disregard faith as something childish or foolishness. Many Atheist are very outspoken these days about people of faith, especially the Christian faith. I like what Norman Geisler once said in his book: “I do not have enough faith to be an Atheist.” What is this faith within the believer, is it something that can be learned or can be earned by some kind of practice or ritual? Where does this faith come from? 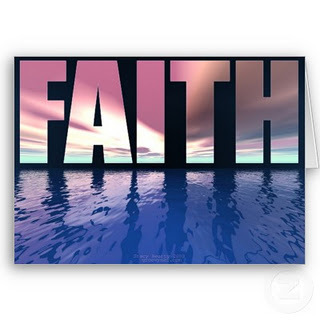 Christians walk by faith, a faith that was not earned or attained. I believe that faith is a gift of God just as salvation is a free gift of God for those who believe in Jesus Christ as Lord and Savior. Before anybody was a true believer and disciple of Christ, they walked in darkness just as everybody else. I came to Christ pretty late in life, at the age of 46 years. What took me so long, and why wasn’t I a believer much earlier in my life? Certainly I had heard about Jesus, and that He died on the cross for my sins. I heard about His resurrection from the dead and that He promised eternal life to those who would believe and follow Him. I’m pretty sure that most people know John 3:16. How come that some received grace and some not? Did God predestined some to be saved and some not? I do not believe that God has chosen some unto salvation and some to hell for eternity (although He knows in His foreknowledge who would come to Him and who not). People have a free will to choose, and that those who reach out to God asking Him for forgiveness will be saved by His grace. I can only go from my experience, how I came to the Lord. I can’t speak for others, everybody has their own unique story. I’m not going into a long-winded story, but I had a severe alcohol problem, and my life was going downhill real fast. I would go on binges days upon days drinking until I would be sick. I took me about a week to get better after these binges and a couple of weeks to get back to drinking resulting in another collapse. Well, long story short, one Sunday morning, May 14th 2006 to be precise, I hit rock bottom. I sat on my patio chair feeling pretty lousy and I remember as if it were today, I cried out to God saying, “please help me, I don’t want to be like this anymore, please God help me I am sorry.” From that moment on, my life completely changed, I was still feeling sick, but something happened, something I can’t fully explain. God took the desire of drinking away and I have not had a drink or desire to have a drink one ever since. That day God changed me, He transformed my life. There used to be twelve packs of beer in my car and Ozzy on my radio. That all changed that day, I went and bought a Bible. Not knowing anything about which translation to get, the first Bible I bought was a NASB version. I’m using the NKJV now, but have others as well to get a better flavor on some passages. I was reading everyday and because I didn’t work at that time and spent all day and night reading God’s word. Looking back, I know that the moment I cried out to God that He saved me from a life of destruction, and the transformation within me started. Today, I have absolute faith in God. It is not a “blind faith” as many atheist like to call it. I know in my heart that God is the truth and that He is faithful. He keeps His promises, and one day I will see Him face to face. Can I prove faith to an unbeliever? Maybe not, but I believe that faith can be shown by the conduct and behaviors of Christians in the world. Genuine faith brings forth good fruit. The unbelievers are already condemned because they do not want to acknowledge God. Many want to keep living in darkness, they want to live a life without being accountable to anyone. They love the lust of the flesh, the lust of the eye and the pride of life. Thank you for sharing the Word of God and your personal testimony, they are powerful! I pray the Lord continues to bless you and reveal Himself to you, so you may share His Truth with others so they too may find salvation in our Lord and Savior Jesus (Yeshua). Jeremiah 1:55 Before I formed thee in the belly I knew thee; and berfoe thou camest forth out of the womb I sanctified thee, and I ordained thee a prophet unto the nations.In other words, God knew Jeremiah berfoe he was born, so he existed berfoe he was born. Pingback: Packaged Faith from the Sewer « Did Jesus have a Facebook Page? Thank you kindly, you are right, faith comes by hearing and hearing by the word of God. I read/study the Bible and with all the modern technology today, I listen to podcast of my favorite teachers. Thank you for visiting my blog. I have really been taking to heart Romans 10:17 lately. I have been faithful to church, hearing sermons, reading the Word regularly, etc. After coming across that verse a while back again, I started thinking about it more and then decided to incorporate hearing the word more regularly, not just reading it. And that verse is definitely accurate. It does make a difference to my faith level when I listen to it more conciously, focusing on it as I listen. We gain so much when we are in the Word. So many people are missing out when they don’t read or listen. There faith would grow. They would learn answers to their questions, etc. Thank you for your blog. Thank you Cindy, are you on FB as well? I like writing, the Lord is good. thanks for your honesty. faith is such a beautiful thing. the more we use it to do the things the Spirit leads to us to, the more faith God gives us! keep writing! you will encourage many.